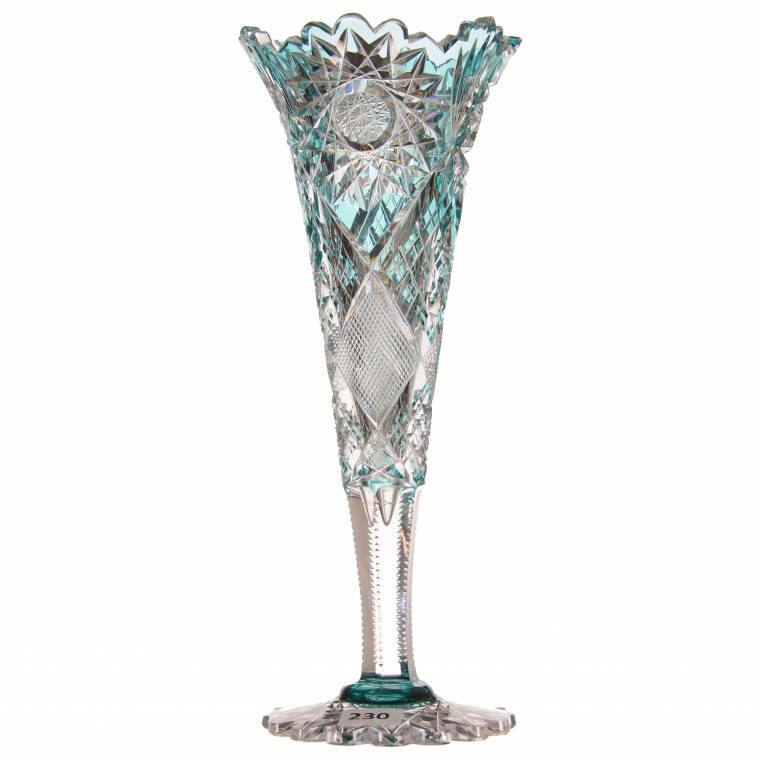 Rare Brilliant Period Cut Glass 10-inch-tall turquoise cut to clear vase. ST. LOUIS - April 12, 2018 - PRLog -- Several collections of Brilliant Period Cut Glass featuring many rare, beautiful, and stunning pieces will come up for bid on Saturday, May 12th, when Woody Auction holds a major public auction at the Crowne Plaza St. Louis Airport Hotel, located at 11228 Lone Eagle Drive in St. Louis, starting promptly at 9:30 am Central time. The hotel is situated not far off exit 235-A of Interstate 70. "This auction is the continuation of the Bill Chandler collection, boasting many important pieces, and will also include the addition of the Stanley and Ruth Gotliffe collection out of New Jersey," said Jason Woody of Woody Auction, based in Douglass, Kansas. "We believe attendees will be surprised and wowed by the amount of quality color cut to clear glass. Many large pattern trays will also be offered." An example of the overall quality of the catalog can be seen in lot 200, a pair of Brilliant Period Cut Glass (BPCG) vases by Dorflinger – one cranberry and one green, both cut to clear – in an unnamed but gorgeous pattern featuring engraved floral with hobstar, vesical and nailhead diamond highlights. The pattern of the vases matches exactly a vase featured in the Philadelphia Museum of Art, presented to the museum by Dorflinger & Sons in 1903. The exceptionally rare vases each stand 11 ¾ inches tall. Online bidding is available now, at www.liveauctioneers.com/woody-auction-llc. Internet bidders are encouraged to register at least 48 hours in advance of the auction. Absentee bids should be submitted with a written statement indicating the amount of the bid. All absentee bids must be received no later than Thursday, May 10th. Bids may be fax'd to 316-746-2145 or e-mailed to info@woodyauction.com. An auction preview will be held at the venue on Friday afternoon, May 11th, from 2-6 pm Central time. As for lodging, guests may book a room at the auction venue – the Crowne Plaza St. Louis Airport Hotel – by calling 314-291-6700 and mentioning Woody Auction to enjoy a special discounted room rate. When calling, have the following discount code info handy: IATA# 99801505, Group Code WA5. • May 26, 2018 – Part 1 of the Headlee collection of RS Prussia. • June 30, 2018 – An online-only auction of antiques and other items. • July 21, 2018 – An online-only auction of antiques and other items. • August 4, 2018 – An online-only auction of antiques and other items. • August 18, 2018 – The Margaret Ireland collection of Carnival glass. Woody Auction is always accepting quality consignments for future sales. To consign an item, an estate or collection, you may call them at (316) 747-2694; or, you can e-mail them, at info@woodyauction.com. To learn more about Woody Auction and the Saturday, May 12th auction, visit www.woodyauction.com.